Skunks, raccoons, and birds are digging up your yard. These animals love to feed on grubs. Dead patches can be pulled up and back like loose carpet. Grubs feed on the grass roots anchoring the turf to the soil. Your lawn feels spongy when walked on. This will happen before any dead patches appear. To be sure it’s a grub problem, peel back a square foot of lawn in various areas. If there are 6 or more grubs in each area, it’s time for action. Japanese beetles, June beetles, and chafers emerge in early summer; you’ve probably sprayed for these insect pests. The beetles feed on plants in the garden and then lay their eggs in the soil in the lawn. In late summer, grubs hatch and begin feeding. They’ll continue to eat and grow until mid-fall, when they’ll burrow deeper into the soil to keep warm over the winter. When the soil warms up again in the spring, large, mature grubs return to the upper surface levels, transform into the adult beetles, and start the process all over again. The key to controlling grubs is to kill them before they hatch and begin to do damage to the lawn. 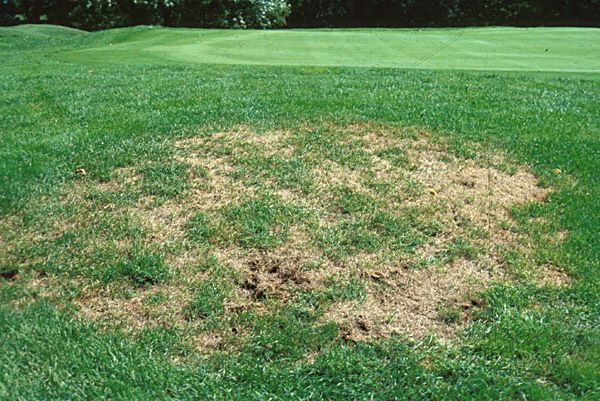 In spring or early summer, apply a preventative grub control such as GrubEx. Water immediately after applying. Keep in mind that a drought-stressed, underfed lawn will show grub damage faster and with fewer grubs per square foot, than a properly-fed, well-maintained lawn. Properly maintained lawns can tolerate more grubs per square foot than a stressed one.